Yorkshire Ambulance Service (YAS) is the NHS ambulance service covering most of Yorkshire in England. It was formed on 1 July 2006 following the mergers of the former West Yorkshire Metropolitan Ambulance Service (WYMAS), South Yorkshire Ambulance Service (SYAS) and Tees, East and North Yorkshire Ambulance Service (TENYAS). It is one of ten NHS Ambulance Trusts providing England with emergency medical services, free at the point of care and as part of the National Health Service it receives direct government funding for its role. Yorkshire Ambulance Service NHS Trust (YAS) serves a population of five million people and employs over 4500 staff and supported by over 1000 volunteers. On an average year, YAS will respond to 700,000 emergency calls and conduct one million patient transport journeys. provide the NHS 111 urgent medical help and advice line in Yorkshire and the Humber as well as Bassetlaw in Nottinghamshire. Yorkshire Ambulance Service covers the counties of West Yorkshire, South Yorkshire, the East Riding of Yorkshire, and North Yorkshire (not including the boroughs of Middlesbrough, Redcar and Cleveland or Stockton-on-Tees, which are covered by the North East Ambulance Service). The headquarters of YAS is located within the Wakefield 41 Business Park to the north of Wakefield city centre and near to junction 41 of the M1 motorway. There are two Administration Centres, one covering the northern area of the Trust, based in Skelton, York and the other covering the southern area of the Trust, based in Moorgate, Rotherham. The Chief Executive is Rod Barnes who was made substantive in his role in May 2015 and prior to this, was the Interim Chief Executive and Executive Director of Finance and Performance. His background is generally finance-based and he has worked in a number of other NHS provider organisations including Taunton and Somerset NHS Foundation Trust and Great Western Ambulance Service. He began his NHS career at Airedale and Harrogate district hospitals and has held a wide variety of leadership positions. He replaced David Whiting, who was Chief Executive between February 2011 and November 2014. Other former Chief Executives were Jayne Barnes OBE (1 July 2006 – 14 January 2008) and Martyn Pritchard (15 January 2008 – June 2010). Barnes emigrated to Australia to take up the post of Assistant Commissioner of Queensland Ambulance Service (South East region) and Pritchard left to take up a role at the Strategic Health Authority. Previous members of the executive team have left under less than auspicious circumstances. David Forster, the Policy and Strategy Director, resigned his position in 2010 after stating that the NHS employed "too many who are lazy, unproductive, obstinate, militant, aggressive at every turn" he also claimed some employees "couldn't secure a job anywhere outside the bloated public sector where mediocrity is too often shielded by weak and unprincipled HR policies". On 8 March 2016, the trust announced that the incumbent Chairman, Della Cannings QPM would be standing down from her position after six years with her final date in office being 9 May 2016. WYMAS was formed in 1974 covering the then new metropolitan county of West Yorkshire and the Craven district of North Yorkshire. It brought together some of the individual city ambulance services which existed across the area and in 1992, it became an NHS trust, providing 24-hour emergency and healthcare services to more than 2.1 million people across the region. 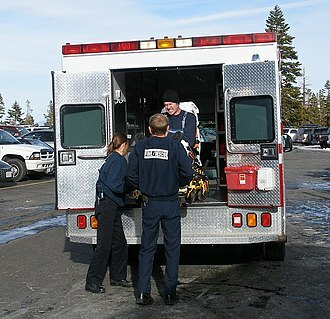 WYMAS had 21 ambulance stations within its operating area. TENYAS was formed on 1 April 1999 as a merger of the former Cleveland, Humberside and North Yorkshire ambulance services and served the urban areas of Middlesbrough, York and Hull along with the rural areas of the Yorkshire Dales and Yorkshire Wolds. SYAS was formed in 1974 as the South Yorkshire Metropolitan Ambulance Service covering the then new metropolitan county of South Yorkshire. On 1 April 1992 it became an NHS Trust and served over 1.4 million people in an area of over 600 square miles (1,600 km2). YAS operates just over 500 emergency vehicles which are a mix of Double Crewed Ambulances (DCAs), crewed by two members of staff (usually a qualified Paramedic or Emergency Medical Technician (EMT) working with an Emergency Care Assistant) and Rapid Response Vehicles (RRVs) which are crewed by a single paramedic, EMT or Emergency Care Practitioner. The emergency fleet is primarily made up of Mercedes Sprinter ambulances, Fiat ducato DCAs and Skoda Octavia rapid response vehicles. YAS also has over 450 Patient Transport Service (PTS) vehicles which are operated by around 696 PTS staff. YAS can deploy rescue helicopters, including two Airbus H145s of the Yorkshire Air Ambulance to emergencies and incidents across the service area, however the Air Ambulance Service is a charity and not an integral part of YAS – paramedics are provided by YAS and work on a rota with doctors who are voluntary members of the BASICS (British Association for Immediate Care) to offer additional medical skills. The Trust entered into a contract with Medical (Europe) Ltd of Malton trading as North of England Ambulance Service by which it could call on up to 13 ambulances, each with two crew members, to cover staff shortages in 2012. This contract was ended in early 2014, however YAS has the ability to call on private companies and St John Ambulance to provide cover in times of extreme need, and a long term contract is held with St John to provide fully crewed ambulances to YAS for emergency and non-emergency work. In 2013–14, YAS staff received 795,750 emergency and urgent calls, an average of over 2,180 calls a day. YAS responded to a total of 708,883 incidents by either a vehicle arriving on scene or by telephone advice. Of these, 267,716 were categorised as immediately life-threatening. Like other English ambulance trusts, YAS has experienced year-on-year growth in activity since it was established in 2006; overall response activity was up by 2% from 2012–13 to 2013–14. YAS delivered the national emergency response target (75% of immediately life-threatening calls were reached in eight minutes and 95% of these calls within 19 minutes) for the third consecutive year in 2013–14. This was only achieved by YAS downgrading a large number of calls to a less serious category, they are due to be investigated by the CQC for this. YAS PTS is the largest ambulance provider of non-emergency transport in Yorkshire and the Humber. In 2013–14, YAS PTS undertook 886,312 non-emergency journeys. needing life-saving treatment such as chemotherapy or renal dialysis. YAS runs the NHS 111 service in Yorkshire and the Humber, Bassetlaw, North Lincolnshire and North East Lincolnshire. The service took its one millionth call in February 2014 and is one of the highest performing NHS 111 services in England. Up to the end of 2013–14, the service responded to 1,100,599 calls, 94.9% of which were answered within 60 seconds (the national target is 95%). YAS has its own Charitable Fund which receives donations and legacies from grateful patients, members of the public and fundraising initiatives throughout Yorkshire. The Charitable Fund exists to support the work of the Trust. Key uses of funds include the provision of additional training and equipment for services over and above the level that would normally be delivered as part of core NHS funding. During 2013–14 and continuing into 2014, the Charitable Fund has been focusing its efforts on raising money for community medical units, which provide on-scene medical treatment for patients with minor injuries and illnesses, and public access defibrillators. The YAS Community and Commercial Training Department has provided first aid and other training services to the NHS, local community and many other organisations for over 15 years. Income generated from these commercial activities is used directly to help fund YAS community initiatives in Yorkshire and the Humber. Students from the Hull York Medical School (HYMS) and Community First Responders (CFR) from across Yorkshire received training from YAS at Hull Royal Infirmary. In 2012 there were 63 medical students who trained as Community First Responders in Hull and York. Following the success of this scheme, a similar scheme-LMSCFR-was launched by medical students from the University of Leeds in December 2016. This scheme now has around 40 volunteer responders from all years of the Leeds undergraduate medical course working to provide responder cover in Leeds, especially within the city centre, Hyde Park and Headingley areas. ^ "YAS Operating Plan" (PDF). Yorkshire Ambulance Service NHS Trust. Retrieved 4 July 2015. ^ "YAS in NHS - Yorkshire Ambulance Service NHS Trust". Yorkshire Ambulance Service NHS Trust. Retrieved 4 July 2015. ^ "Yorkshire Ambulance Service appoints new Chief Executive and Director of Operations" (Press release). Yorkshire Ambulance Service NHS Trust. 12 May 2015. Retrieved 4 July 2015. ^ "Changes in Yorkshire Ambulance Service Trust Board". Association of Ambulance Chief Executives. Retrieved 11 December 2014. ^ "Ambulance service director criticises 'lazy' staff". The Northern Echo. Retrieved 19 April 2018. ^ Yorkshire Ambulance Service (8 March 2016). "Chairman steps down after six successful years" (Press release). Yorkshire Ambulance Service NHS Trust. Retrieved 12 March 2016. ^ "Taking Healthcare to the Patient: Transforming NHS Ambulance Services" (PDF). Department of Health. 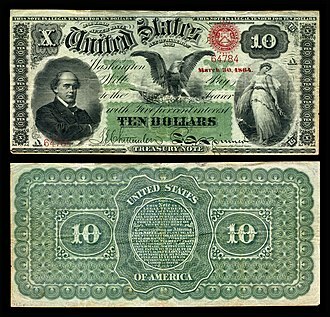 Retrieved 9 January 2016. ^ "New fleet of A&E Ambulances hit Yorkshire - Yorkshire Ambulance Service - O&H". O&H Vehicle Conversions. 25 October 2018. Retrieved 3 December 2018. ^ "YAS Ambulance Response". Yorkshire Ambulance Service NHS Trust. 6 April 2013. Retrieved 6 April 2013. 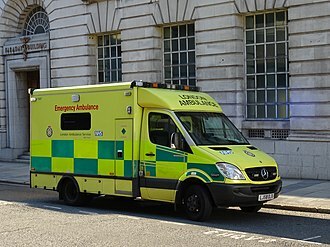 ^ "Ambulance bosses dismiss union's accusations of "manipulating" response figures". Bradford Telegraph and Argus. 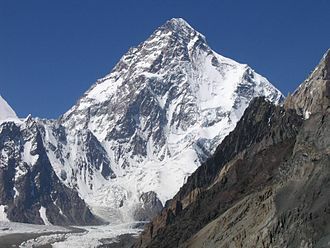 Retrieved 19 April 2018. ^ "First Aid Courses Yorkshire". Yorkshire Ambulance Service. Retrieved 11 December 2014. ^ "HYMS Medical Students train with YAS to be CRFs" (Press release). 22 February 2012. Retrieved 1 May 2012. ^ "Dennis Parker Innovation Prize" (Press release). 9 December 2016. Retrieved 30 October 2017. The Hull York Medical School is a medical school in England which took its first intake of students in 2003. The early history of education in Hull and York goes back to the three following institutions, Hull Medical School, York Medical Society and the York Medical School. Notable doctors associated with the York school included John Hughlings Jackson, Daniel Hack Tuke, Thomas Laycock, James Atkinson and it is thought that the York school closed in the 1860s. The medical school admits 140 students each year, around 1,000 applied for 2013 entry. Of the successful applicants each year, half are based at the University of Hull, in 2014, HYMS was ranked 20th in the UK by the Guardian University Subject Guide and 27th in the UK by the Complete University Guide 2014. As of 2006 applicants have been required to sit the UKCAT admissions test, information about the test and preparation can be found at UKCAT. The course has had, in the past, a proportion of mature students when compared to other medical courses. The 2005 intake had 44 mature students spread over both Hull and York universities, a number than in most medical schools. Students spend the two years in one at their academic bases. Phase two consists of rotation around York, Scunthorpe and Scarborough, in the final year of the course, students essentially take on the role of a junior pre-registration house officer and are able to carry out an elective period overseas. This is a feature in most UK medical curricula. The schools first international students began their studies in September 2006 and this has been praised by the General Medical Council and students alike, who see the vocational nature of the course one of the most exciting parts of their medical education. The course uses clinically orientated subjects, as opposed to medical school subjects which are more abstract science based. Like other medical schools, HYMS offers the ability to intercalate a BSc degree in subjects, such as anatomy, biology. Students spend five years at HYMS and graduate with an MB BS degree and he co-presented a second series with von Hagens in 2006 called Autopsy and Death. It had a resident population of 135,200 in 2011. It is represented in Parliament by Anna Turley for the Redcar constituency and by Tom Blenkinsop for the Middlesbrough South, the borough borders Scarborough and Hambleton in North Yorkshire, and the unitary authority areas of Stockton-on-Tees and Hartlepool. The district was created in 1974 as the borough of Langbaurgh, the borough was named after the ancient Langbaurgh wapentake of Yorkshire. On 1 January 1988 the borough was renamed Langbaurgh-on-Tees, Cleveland County was abolished on 1 April 1996, with its districts becoming unitary authority areas. At this time Langbaurgh-on-Tees was renamed Redcar and Cleveland, Cleveland County was a two-tier local authority, with the county council being superior to its four districts, of which Langbaurgh-on-Tees was one. Upon becoming an authority, Langbaurgh-on-Tees acquired all the full rights and duties as a county. Redcar and Cleveland Civic Centre is in the Leisure and Community Heart, the centre was opened in 2014 at a cost of £31 million. It contains civic and business including a council chamber, mayor’s parlour, register services, meeting rooms,44 business units, as well as sport. It replaces the previous civic centre in Teesville, which was demolished in 2012, Civic facilities were relocated, Inspire 2 Learn, formerly the Eston City Learning Centre, in Teesville. The Mayors office was relocated to Kirkleatham Museum, before moving to Redcar. The Council has offices in Redcar at Kirkleatham Street and in Guisborough, the old town hall closure provided an environmental boost as it was the authoritys worst-performing building for carbon dioxide emissions. This is a chart of trend of gross value added of South Teesside at current basic prices published by Office for National Statistics with figures in millions of British Pounds Sterling. The chemical companies are all members of the Northeast of England Process Industry Cluster, lotte Chemicals are expanding both PTA and PET production. Huntsman manufacture polyurathane intermediates and Ensus have built Europes largest bioethanol facility, biffa Polymers now operate a polymer recycling plant that handles up to 30% of the UKs plastic milk bottles. 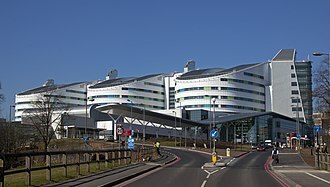 The National Health Service is the publicly funded national healthcare system for England and one of the four National Health Services of the United Kingdom. It is the largest and the oldest single-payer healthcare system in the world, Some services, such as emergency treatment and treatment of infectious diseases are free for everyone, including visitors. Free healthcare at the point of use comes from the principles at the founding of the National Health Service by the Labour government in 1948. Some specific NHS services do however require a financial contribution from the patient, for eye tests, dental care, prescriptions. However, these charges are often free to vulnerable or low income groups, the NHS provides the majority of healthcare in England, including primary care, in-patient care, long-term healthcare and dentistry. 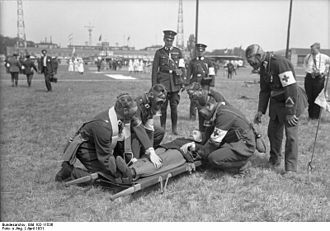 The National Health Service Act 1946 came into effect on 5 July 1948, private health care has continued parallel to the NHS, paid for largely by private insurance, it is used by about 8% of the population, generally as an add-on to NHS services. The NHS is largely funded from taxation with a small amount being contributed by National Insurance payments. The UK government department responsible for the NHS is the Department of Health, the Department of Health had a £110 billion budget in 2013-14, most of this being spent on the NHS. Sources do not always clear if they refer to the whole of the NHS or only to England. There is no unified British NHS, the National Health Service in Scotland and Northern Ireland were always separate, the Health and Social Care Act 2012 came into effect in April 2013, giving GP-led groups responsibility for commissioning most local NHS services. Starting in April 2013 Primary Care Trusts are being replaced by General Practitioner -led organisations called Clinical Commissioning Groups, under the new system, a new NHS Commissioning Board, called NHS England, oversees the NHS from the Department of Health. The Act has associated with the perception of increased private provision of NHS services. NHS Trusts are responding to the Nicholson challenge which involved making £20 billion in savings across the service by 2015, Some NHS organisations are using referral management centres to help reduce inappropriate referrals in an attempt to save the NHS money. 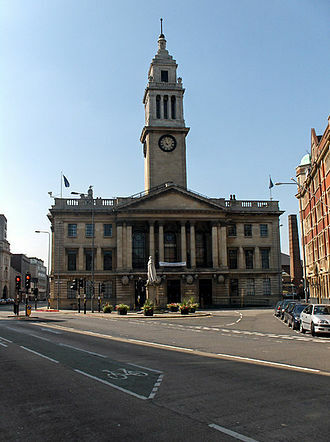 Kingston upon Hull, usually abbreviated to Hull, is a city and unitary authority in the East Riding of Yorkshire, England. It lies upon the River Hull at its confluence with the Humber estuary,25 miles inland from the North Sea, the town of Hull was founded late in the 12th century. The monks of Meaux Abbey needed a port where the wool from their estates could be exported and they chose a place at the confluence of the rivers Hull and Humber to build a quay. The exact year the town was founded is not known but it was first mentioned in 1193, renamed Kings-town upon Hull by King Edward I in 1299, Hull has been a market town, military supply port, trading hub and whaling centre, and industrial metropolis. Hull was a theatre of battle in the English Civil Wars. Its 18th-century Member of Parliament, William Wilberforce, took a prominent part in the abolition of the trade in Britain. The city is unique in the UK in having had a municipally owned telephone system from 1902, sporting cream, not red, telephone boxes. After suffering heavy damage in the Second World War, Hull weathered a period of decline, gaining unfavourable results on measures of social deprivation, education. In the early 21st-century spending boom before the late 2000s recession the city saw large amounts of new retail, housing, tourist attractions include the historic Old Town and Museum Quarter, Hull Marina and The Deep, a city landmark. The redevelopment of one of Hulls main thoroughfares, included the opening of St Stephens Hull, spectator sports include Premier League football and Super League Rugby. The KCOM Stadium houses Hull City football club and Hull F. C. rugby club, Hull is home to the English Premier Ice Hockey League Hull Pirates. The University of Hull was founded in 1927 and now more than 16,000 students. It is ranked among the best in the Yorkshire and the Humber region and located in the leafy Newland suburb, in 2013, it was announced that Hull would be the 2017 UK City of Culture. In 2015 it was announced that the Ferens Art Gallery will be hosting the annual art prize, The Turner Prize. West Yorkshire is a metropolitan county in England. It is an inland and in relative terms upland county having eastward-draining valleys while taking in moors of the Pennines and has a population of 2.2 million, West Yorkshire came into existence as a metropolitan county in 1974 after the passage of the Local Government Act 1972. 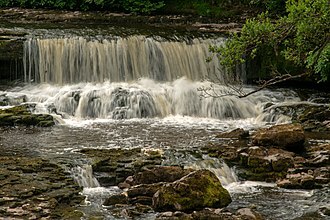 West Yorkshire consists of five boroughs and shares borders with the counties of Derbyshire, Greater Manchester, North Yorkshire. In the heart of the county is Leeds Bradford International Airport, West Yorkshire County Council was abolished in 1986 so its five districts became effectively unitary authorities. However, the county, which covers an area of 2,029 square kilometres, continues to exist in law. 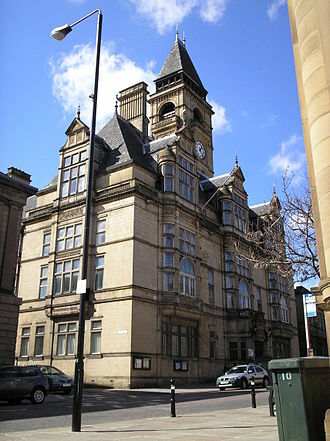 West Yorkshire includes the West Yorkshire Urban Area, which is the most built-up, West Yorkshire Metropolitan County Council inherited the use of West Riding County Hall at Wakefield, opened in 1898, from the West Riding County Council in 1974. Since 1987 it has been the headquarters of Wakefield City Council, the county initially had a two-tier structure of local government with a strategic-level county council and five districts providing most services. In 1986, throughout England the metropolitan county councils were abolished, the functions of the county council were devolved to the boroughs, joint-boards covering fire and public transport, and to other special joint arrangements. Organisations such as the West Yorkshire Passenger Transport Executive continue to operate on this basis, although the county council was abolished, West Yorkshire continues to form a metropolitan and ceremonial county with a Lord Lieutenant of West Yorkshire and a High Sheriff. Wakefields Parish Church was raised to cathedral status in 1888 and after the elevation of Wakefield to diocese, Wakefield Council immediately sought city status and this was granted in July 1888. However the industrial revolution, which changed West and South Yorkshire significantly, led to the growth of Leeds and Bradford, Leeds was granted city status in 1893 and Bradford in 1897. The name of Leeds Town Hall reflects the fact that at its opening in 1858 Leeds was not yet a city, the county borders, going anticlockwise from the west, Greater Manchester, South Yorkshire and North Yorkshire. Wakefield is a city in West Yorkshire, England, on the River Calder and the eastern edge of the Pennines, which had a population of 77,512 at the 2011 Census. Wakefield was dubbed the Merrie City in the Middle Ages and in 1538 John Leland described it as, so that all vitaile is very good and chepe there. A right honest man shall fare well for 2d, there be plenti of se coal in the quarters about Wakefield. 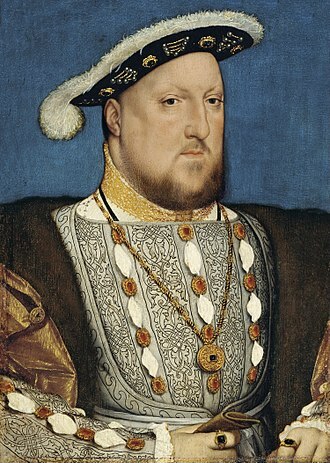 The Battle of Wakefield took place in the Wars of the Roses, Wakefield became an important market town and centre for wool, exploiting its position on the navigable River Calder to become an inland port. 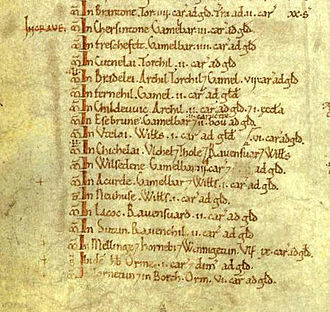 In the 18th century, Wakefield traded in corn, coal mining and textiles, in the Domesday Book of 1086, it was written Wachefeld and as Wachefelt. Flint and stone tools and bronze and iron implements have been found at Lee Moor and this part of Yorkshire was home to the Brigantes until the Roman occupation in AD43. Wakefield was probably settled by the Angles in the 5th or 6th century and they divided the area into wapentakes and Wakefield was part of the Wapentake of Agbrigg. The settlement grew near a place on the River Calder around three roads, Westgate and Kirkgate. The gate suffix derives from Old Norse gata meaning road and kirk, before 1066 the manor of Wakefield belonged to Edward the Confessor and it passed to William the Conqueror after the Battle of Hastings. 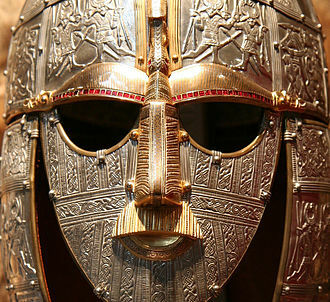 After the Conquest Wakefield was a victim of the Harrying of the North in 1069 when William the Conqueror took revenge on the population for resistance to Norman rule. The settlement was recorded as Wachfeld in the Domesday Book of 1086, the manor was granted by the crown to William de Warenne, 1st Earl of Surrey whose descendants, the Earls Warenne, inherited it after his death in 1088. The construction of Sandal Castle began early in the 12th century, a second castle was built at Lawe Hill on the north side of the Calder but was abandoned. Wakefield and its environs formed the caput of an extensive baronial holding by the Warennes that extended to Cheshire and Lancashire, the Warennes, and their feudal sublords, held the area until the 14th century, when it passed to their heirs. 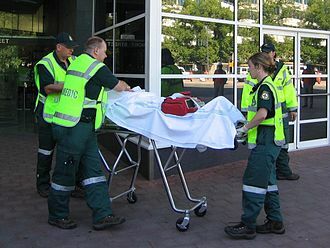 The organisation relies on volunteer medical professionals and Allied Health Professionals to provide immediate healthcare assistance in support of the emergency services. BASICS is an association of health professionals, who undertake additional training as immediate care practitioners. The members provide their services in support of the statutory or voluntary ambulance services, BASICS members are used to provide extra skills at the scene of major incidents, or for particularly difficult patients. 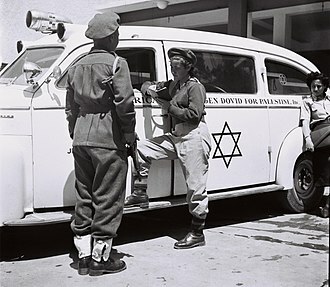 For this, individuals may be summoned on a case by case basis by the ambulance control centre. They work at events, often alongside the voluntary ambulance services or the statutory service. An example of this response would be seen at an industrial accident where for example a worker has become trapped in machinery. 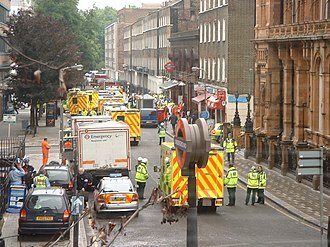 The ambulance service would work alongside the service to co-ordinate the rescue. BASICS started up as a number of General Practitioners who were concerned about the immediate care that car crash victims were receiving. Cleveland /ˈkliːvlənd/ is an area in the north-east of England. 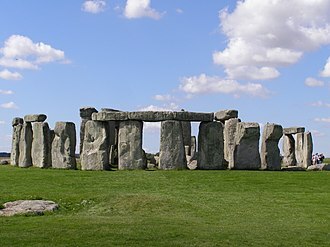 Its name means literally cliff-land, referring to its southern areas. 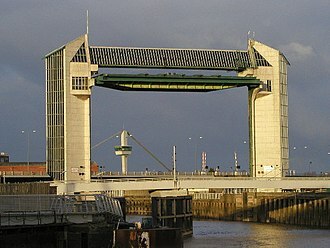 It was situated around the Teesside urban area and included Middlesbrough, Stockton-on-Tees, the Bill as originally presented in November 1971 intended the county to be called Teesside. The county was abolished in 1996 with its boroughs becoming unitary authorities, the Cleveland Hills, in the southern part of the district, were key suppliers of the ironstone that was essential to the running of the blast furnaces alongside the River Tees. Between 1974 and 1996 most of Cleveland was incorporated into a county of the same name, formed from parts of the North Riding of Yorkshire. Unlike the traditional area, the county was formed around the Tees estuary. The four districts of the County of Cleveland were Hartlepool, Langbaurgh-on-Tees, Stockton-on-Tees and it had a total area of 225 square miles and an estimated population of 567,600 in 2000. 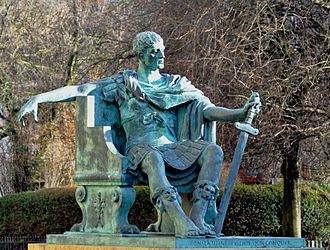 The county bordered County Durham to the north and North Yorkshire to the south, Cleveland was one of the areas in the first tranche of reviews conducted by the Banham Commission. This was fiercely contested by Cleveland County Council, who applied for judicial review over the decision. According to the Minister, David Curry, in the Commons debate on the order on 11 January 1995, as the first of the Orders to be laid before Parliament, it was done in two stages. A division was forced by the Opposition, on the first Order, of Clevelands 6 MPs, Mo Mowlam and Frank Cook voted against, with Tim Devlin and Michael Bates voted for. Stuart Bell and Peter Mandelson were present at the debate but did not vote, on 1 April 1996, the Orders came into force. The district of Langbaurgh-on-Tees was renamed Redcar and Cleveland, the County of Cleveland was abolished, the post of Lord Lieutenant of Cleveland was abolished, with the area being split between the ceremonial counties of Durham and North Yorkshire. However, Cleveland Police and other covering the four boroughs, were retained. 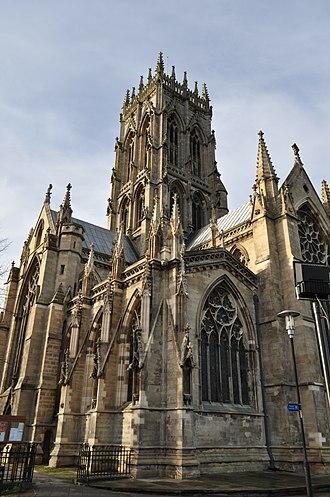 Cleveland is a Church of England archdeaconry, in the Diocese of York and it covers a large area including Middlesbrough, Thirsk and Whitby. Skidby Windmill is surrounded by fertile agricultural land typical of the East Riding. Cliffs of Carboniferous Limestone are a common geological feature in the Yorkshire Dales; this panoramic image shows the western face of Thwaites Scars taken from Long Lane. 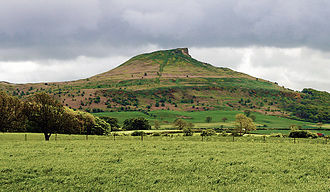 Roseberry Topping, one of the most enduring symbols of ancient Cleveland. 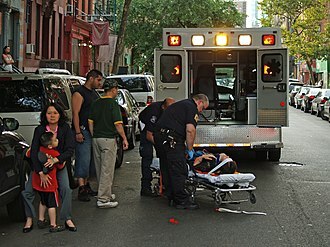 EMTs tend to a woman with a spiral fracture at a roller derby bout.